Unfortunately, we lost Mrs. McCabe to a sudden heart attack even as she had her forever home lined up. 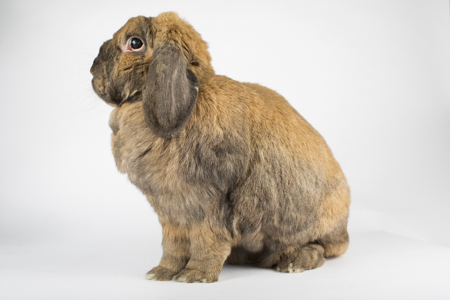 We will miss her gentle spirit greatly -- she was loved by all the SaveABunny volunteers and she was a great outreach rabbit. Rest in peace, graceful lady - we'll miss you. Well hello there! I am a BIG beautiful, spayed, French lop girl. I'm very mellow, love to be snuggles and petted and will flatten into a big,mushy, puddle of bunny love. Did I mentioned that I am BIG---all 11 pounds 8 ounces of my bunny beauty. A lot of people mistakenly think that big bunnies are more work than little bunnies, but that is not true! Also, we bigger bunnies tend to be mellower and easier to handle than squirmy, nervous dwarf rabbits. Think about the dog world...who is more easy going--a yappy little dog, or a large golden retriever! It's a similar concept with rabbits. Another plus about me is that I am very tidy and use my litter box! I am such a great bunny in so many ways--especially for first time bunny guardians and families with well-behaved children. I hope you will visit me soon! P.S. I am named in honor of a glamorous longtime SaveABunny donor.